It’s probably the wrong way to start a post but my bum is burning. The cause is thankfully not a recipe where I misjudged the spicier ingredients, but instead another walk around the park. Today I left my car further away than before, partially to avoid parking fees, but also to try and up my distance capability. It’s a different time of day (late afternoon) and the park is full of people on bikes, dogs, footballers and joggers. I am bemused by joggers. I don’t dislike them – I just have a mixture of feelings that range from mystified as to why they do it to maybe a bit envious. It’s never something I’ve wanted to do – but I’ll be honest and say it is something I’d like to be able to do. I suppose that jogging or running is to them what walking is to me – both challenging and satisfying. 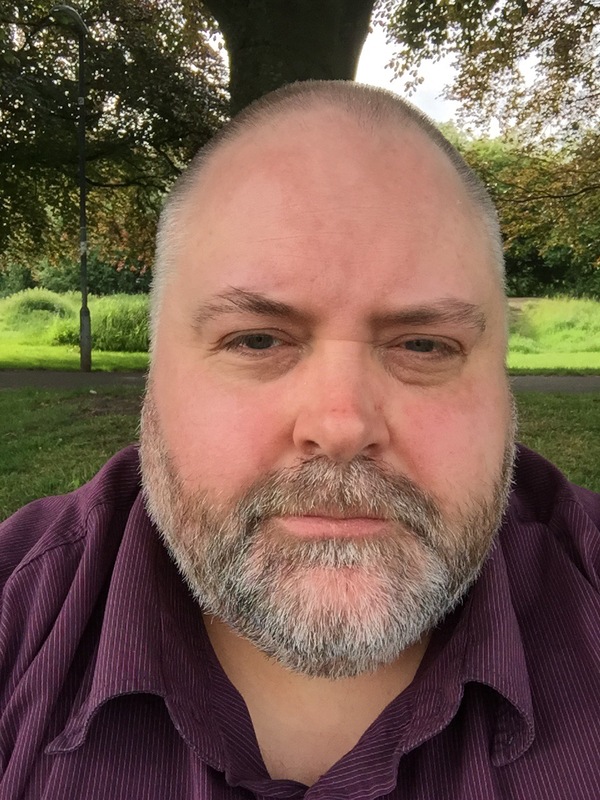 Honestly I can’t ever remember being able to properly run or actually running for anything more than a couple of busses – even when I was a lighter man. It’s just never appealed and it always made me feel awkward. There goes another one. Running. As casual as you like while my bottom burns. If only. Sigh. Long distance movement interests me though. I want to be able to walk without bench hopping everywhere and not stopping all the time – although I like watching people and this current level of fitness is definitely compatible with that pastime! It’s been a nice bank holiday so far. I’ve done a bit of cleaning, a modest amount of cooking and a few hours of playing video games. 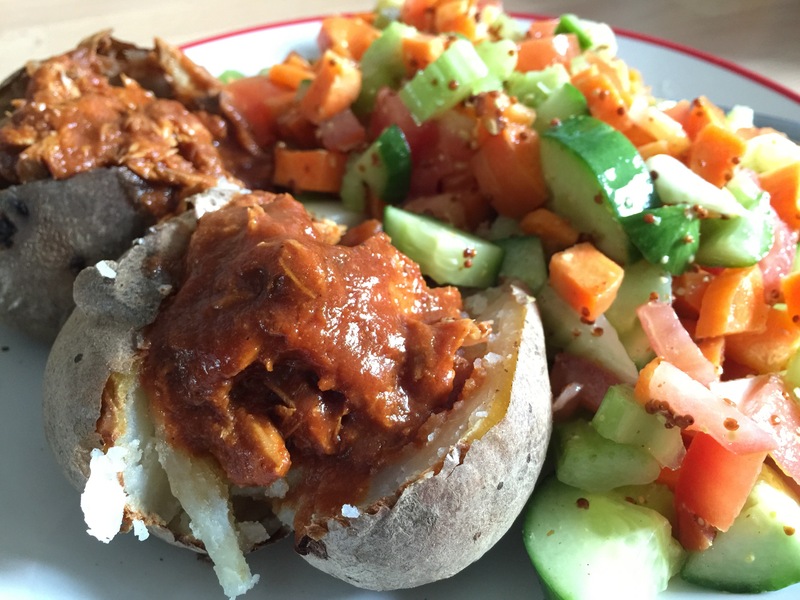 My baked potatoes today were topped with mackerel in spicy tomato sauce and had an absolutely delicious salad with them. The only syn (1 of them) was in the rounded desert spoon of wholegrain mustard which I mixed with cider vinegar to make the dressing – and it tasted divine! I’m not sure what to have tonight just yet – although someone from the Slimming World group gave me a recipie for tuna and sweetcorn fritters today which looked really nice. I might make a batch and take some to work with me tomorrow. I’m definitely going a bit further between benches today, and I’m a little more confident about being able to do it without pulling anything. Some swans have stopped nearby to my new bench and they look absolutely lovely. There are three swanlings (?) with them too! As I’m looking at them an old lady stops to watch them with me. 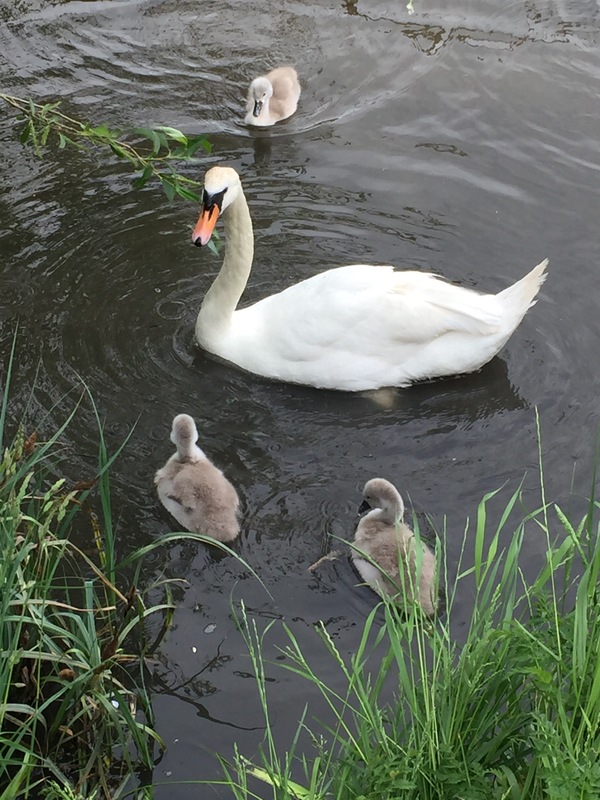 ‘I’ve forgotten what the baby swans are called…’ I say to her, a little embarrassed. She smiled and nodded with her hands behind her back and continued to look at the swans. ‘I suppose you’re right.’ she sighed and smiled again before walking briskly away. There are two men in front of me playing boules with several shiny metal balls on the rough gravel surface by one of the larger circular flower beds in the park. They’re both relatively young but quite bald and the mild sunlight is reflecting from their heads. One of them had just hit his opponent’s boule and with a loud crack pushed it out of the scoring zone. ‘That’s what I want baby!’ He exclaims excitedly. This seems quite competitive and I notice the box for their boules is scuffed and old. They must do this a lot. They appear to be playing for some kind of wager but I’m not sure what it is. A young girl in a check shirt with dark hair tied back in a ponytail sits cross legged not far away front of me. She is occasionally watching them but seems to be mostly focused on the grass, which she’s plucking and sprinkling on the wrinkled denim on her knees. I’m not sure she’s happy. She seems distracted and trying to calm down. As I progress I walk past what appears to be a fitness instruction group – the three leaders are wearing military fatigues but the participants are clearly not recruits. They’re doing star jumps and squat thrusts next to an Indian family playing miniature golf with their little children. The kids don’t seem to be able to get the balls in the holes and their mother is sneakily nudging them in as they roll close to her foot. The children still see it as a win and one of them with glasses and neatly combed dark hair punches the air with satisfaction. Nearby I notice a sign – and it’s satisfying to know (I didn’t realise before) what I’m doing. 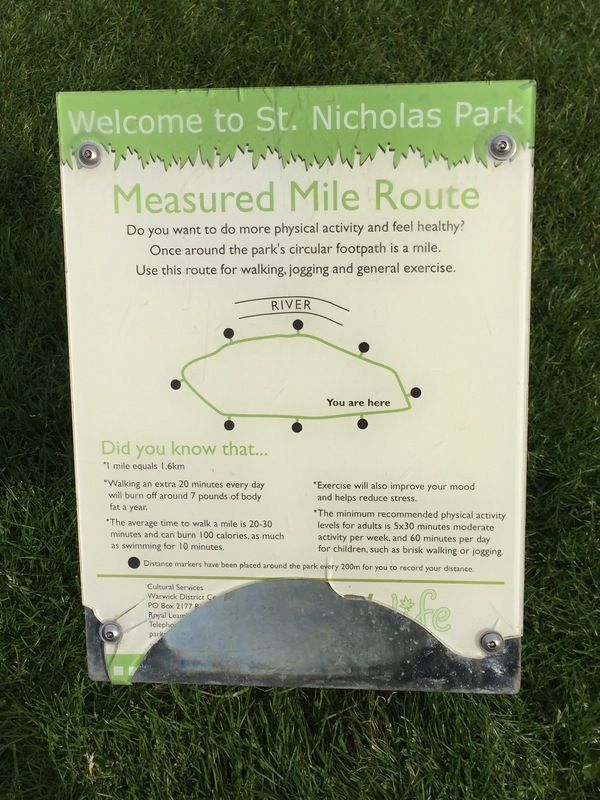 Each circuit of this park is a mile. It’s taken me way more than the suggested time – but I don’t really care. I’m just happy to be out and about. Two Eastern Europeans drive past chatting on motability scooters, and they both seem to be in a really good mood as well. I decide to get up and make my way back to the car. There are two benches between me and it and I’m going to see if I can only use one. Nope. That’s a bridge too far. I’ve had to sit on the grass. My legs have almost nothing left and feel all wobbly. I can definitely tell that leaving the car further away makes a difference. I’m going to park there again next time and see if it has the same effect. Hopefully it will be easier next time. It’s not all bad though. While sitting I’ve been accosted by a lovely golden Labrador with long hair that came over to say hello (despite its owner’s protests!) It’s stopped to accept some patting and stroking in exchange for slobbering all over me. I don’t mind in the least. Dogs always make me smile! Right. Get your fat bottom up and get to the car. You can do it. Right. That’s it. I’m done. I feel good though, despite being the proud owner of a pair or jelly legs. Tomorrow is another, and hopefully easier day. For now, it’s time to cook. I’m fungry (work it out). Come back to work Daveling!